“Paris Story” playing cards published by Éditions Philibert, c.1957, showing photographic scenes of Paris. Each card has suit symbols and indices superimposed in the corners, and the court designations are both English (K,Q,J) and French (R,D,V). The backs have the letters of the word "Paris" in black and gold set against a red sailing ship. 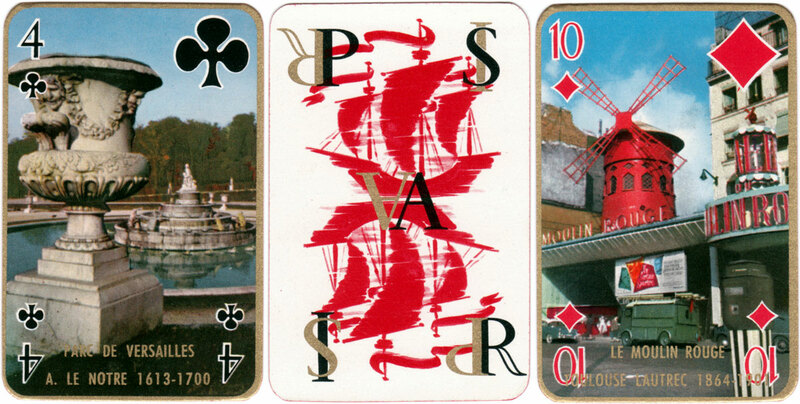 Above: “Paris Story” playing cards published by Éditions Philibert, c.1957, showing photographic scenes of Paris. 52 cards + 2 jokers + title card in plastic box. The card stock is thick and the printing is superb as with all Philibert decks. The cards are edged in gold but the sides are red gilt. Images courtesy Rex Pitts.